Paddling Archives - Page 2 of 13 - GetGoing NC! Photo courtesy Great Outdoor Provision Co.
Years ago, I was in the market for a mountain bike. I went to the old Spin Cycle in Cary, picked out a bike, asked if I could take it for a test ride. Sure, they said. Plenty of residential streets behind the store: knock yourself out. Trouble was, it was a mountain bike; riding it on asphalt wouldn’t give me much of a feel for how it handled rocky, rooty trail. Fortunately, I knew of some of the later weaving between the former. I returned a half hour later with a dirt covered bike — which I wound up buying. The point: for a big-ticket item that’s performance-based, buying it sight-untested is silly. Yet we do it all the time with our outdoor gear. With kayaks, for instance. With a boat, that needn’t necessarily be the case. 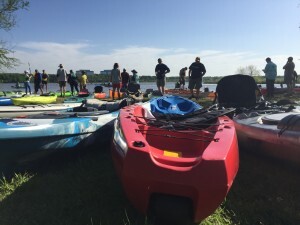 Great Outdoor Provision Co. sponsors boat demo days in its main markets in North Carolina and Virginia where you’re welcome to come and compare and contrast a variety of boats.